Went for a small trip to GW yesterday to pick up the latest White Dwarf, hoping for some Dark Angel hints, and after a quick flick through Im only seeing possibly hints of an Ork-related happening on 2 June? It could be a new Codex (the last one was a while back?) or some sort of Ork-themed party at GW- there's a full single page and double page spread regarding this, but with very minimal information. So who knows whats really happening? To be honest, i'd like to see some more Orkish goodness- I still dont think I have enough Deathskulls (roughly 3200pts straight WYSIWYG so far, including Stompa), and even if the base mechanics of them dont change then at least some new models or units would be nice. However, I digress- where this is going is that without any tangible evidence concerning the boys of the First Legion at this time I'm feeling less inclined to put brush to mini to finish my two Tactical and one Devastator squads. Not that I dont love them, but I feel that variety is the spice of life. 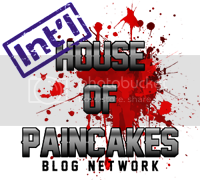 I spent a good 15 minutes of so discussing the new paint range with the staff, as well as giving the "base" (Foundations) and Dry paints a spin, and so far everything i've seen has been fantastic. Ceramite White has exceptional coverage over black, I think i'll be getting some of this to clean up my DA tank chapter symbols, and the myriad greens available in the 'layers' (ie normal paint) section makes me warm and fuzzy on the inside as a Dark Angel and Ork player. However the colour that drew my attention the most was the replacement for Mechrite Red, most appropriately called 'Mephiston Red' after the Blood Angel's Chief Librarian (know on the Internetz as 'Space Dracula'). It seems that GW has realised that the main reason for Mechrite's use is to paint up vibrant red power armour, so this Base colour is now a lot closer to the old superceded Blood Red (now replaced with the very close Wild Rider Red- like Blood Red, with some orange thrown in). 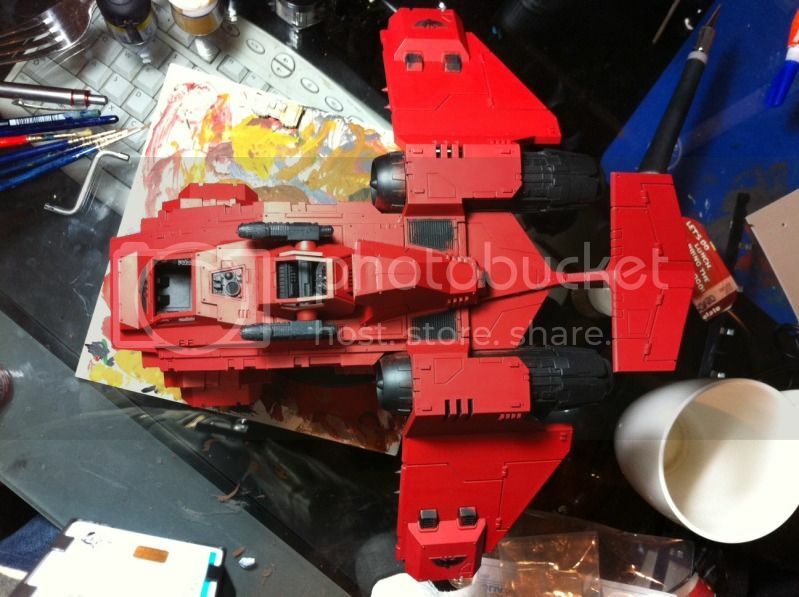 So I bought a pot of Mephiston Red, and decided to re-base coat my Stormraven Gunship which had previously been given a 50% coverage of Mechrite. And it turned out to be very, very interesting. Here's how its sitting after a coat of the new paint. Tony Stark: "Tell you what. Throw a little hotrod red in there". Jarvis: "Yes, that should help you keep a low profile". Now I dont want to speak ill of the dead, but im glad Mechrite is no more. Although it had phenomenal coverage, I always found the colour to be very muted and dull, a view that the GW staff shared with me. 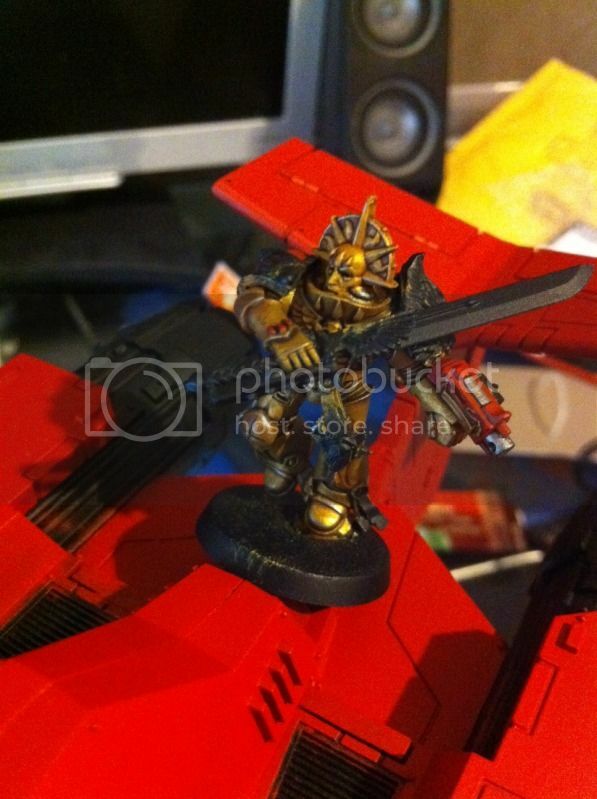 The main issue that stems from this is that in order to paint up a Blood Angels, Saim Hann Eldar or Evil Sunz Ork army one had to put down a base of Mechrite that was basically just going to end up being 95% or more covered by a lighter and brighter red. This basically meant that for all the wondeful time savings of the Foundation paint- quick to apply, great coverage etc- you were eventually going to go back over the mini again with another coat to bring up the red. In my opinion its heaps easier to throw down a brighter base colour and spend 30 seconds applying a Shade (Wash) to change the base colour. Dull down in 30 seconds and get natural shading with a Shade, vs apply a brighter colour which could take 10+ minutes on a marine? I know which i'd prefer. The other issue I had with Mechrite (and a lot of the Foundations) was grainyness- most likely due to the higher amount of pigment- even when applied watered down a touch the finish seemed grainy and textured. Oh well, as I said: Mechrite is gone. So with that, how does Mephiston Red perform? 'Cant say im sorry to see it go. Meph Red is dynamite IMO. Really well as it would seem. 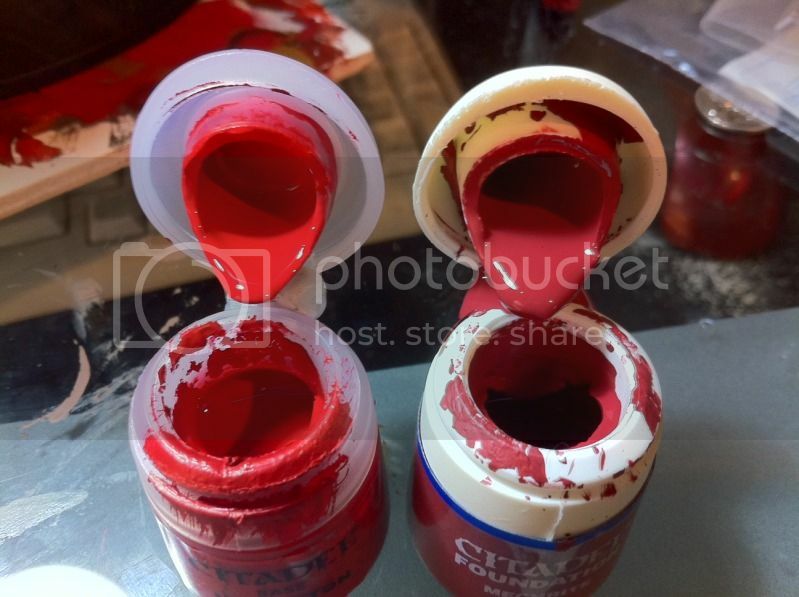 The paint consistency in the pot appears thinner than the prior Foundations, which partially goes to explain why it doesnt do a 100% coverage on black straight up, however a second pass completely covers and the colour comes right out. I was also very happy to see that the colour pops out enough without being that eye-searing 'Early 90s GW red'*, I can also see my entire Blood Angels army being based in this scheme. The current GW Blood Angels painting Recommendation is Mephiston Red (Base)> Carroburg Crimson (Shade)> Edge Highlight-Evil Sun Scarlet (Layer)> Highlight- Wild Rider Red (Layer). I think i'll be playing around with all these colours to determine the best scheme for me, but either way I'm hoping to get something that 'pops' on the tabletop.